The permanent exhibition currently on view is third in the series of exhibitions that have provided visitors with an overview of the ancient culture of the Nile Valley, since the foundation of the collection in 1934. A selection of the finds from Hungarian excavations in Egypt is put on view on the left side of the first hall. At the further end of this room, thematic exhibition cases illustrate the worship of sacred animals, Late Period funerary cults and ancient Egyptian scripts. Display cases on the right side of the first hall display pharaonic artefacts in chronological order. Grinding palettes used for preparing cosmetics date to the foundation of the Egyptian state (c. 3000 B.C.). Cylindrical jars, often adorned with crossed-lines, decoration, were produced in the Naqada period (c. 5500–3000 B.C.). These finds, together with the stone and alabaster vessels exhibited in the Old Kingdom display case (c. 2670–2195 B.C. ), were all placed in tombs. According to ancient Egyptian religious belief, the dead continue to need their everyday objects, as well as their servant’s work in the afterlife. In the First Intermediate Period (c. 2195–2040 BC) this problem was solved by placing painted wooden "servant figurines" inside the tombs. These models were depicted as carrying out different kinds of activities. The fragment of a royal portrait is exhibited in an independent display case. The owner of the basalt statue is wearing the characteristic attire of the pharaoh, the striped nemes headdress, which is adorned on the forehead with a diadem in the shape of an uraeus serpent. The elaborate design of the portrait, as well as the refined polishing of its surface represent the high quality of Middle Kingdom sculpture (c. 2040–1782 B.C.). The second hall opens with works of art dating to the New Kingdom (c. 1550–1075 B.C.). The large stele carved from reddish crystalline sandstone was made for Noferhaut, chief of police troops serving Pharaoh Tuthmosis III, popularly called "the Napoleon of Egypt". In the upper register of the stele, the king presents an offering to Amun-Ra, king of the gods, whose power is also celebrated in the hymn included in the stele’s inscription. In the exhibition case displaying applied arts, there are shabtis made from Egyptian faience, small vessels of different shapes for holding cosmetics and perfumes, as well as amulets, pendants and necklaces that women were fond of wearing. 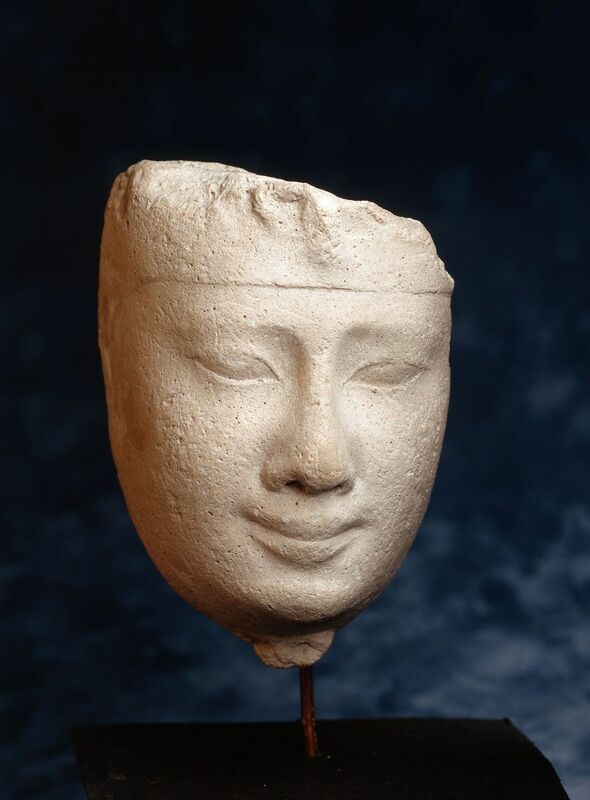 The limestone head of a young man is one of the most beautiful items of the collection. The young face, showing an otherworldly expression and a serene smile, is harmonically framed by an elaborately designed bipartite wig. Similarly striking is the beauty of the crystalline sandstone statue of a young girl holding the emblem of the goddess Hathor in her hand. The unique artistic expression of the Third Intermediate Period (c. 1075–712 B.C. ), which followed the decline of the New Kingdom, is represented by the so-called "mythological papyrus" displayed on the wall in the second room. These vignettes, often without any textual reference, illustrate the religious ideas of the age in a rich and varied form, from cosmological concepts to funerary beliefs. The same holds true for coffins produced in this era. Even members of the Theban clergy had to content themselves with shared galleries instead of large, richly decorated tombs of their own. Decorations evoking conceptions of the afterlife were thus delegated from the tomb walls to the surface of coffins, as illustrated by the items on view here. One of the most valuable pieces of our collection, the kneeling statue of Prince Sheshonq, was also created in the Third Intermediate Period. The "little prince", still a child, is wearing the characteristic habit of Memphite high priests, and holding a small shrine in his hand, in which the figure of Ptah-Sokar-Osiris is carved in relief. The statue came to light in the 19th century in the Serapeum, the burial place of the Apis bulls, and after many adventures was presented to the Museum as a gift by György Sipos, a Hungarian then living abroad. The richest part of our collection belongs to the Late Period (c. 712–332 B.C.) of Egyptian history. In the showcase displaying applied arts, there are heart scarabs and heart amulets, which served as important paraphernalia in the funerary cult. Richly decorated, gilded cartonnage masks are also exhibited: in the Graeco-Roman period, these were often placed on the head of the deceased.